DORA MAAR: MUSE OR PHOTOGRAPHER? Why have I written so little about photography? Possibly because, unlike in other areas, my taste is quite narrow. I obviously like Weegee; Diane Arbus is another star in my book; and John Coplans, if he really was a photographer. He certainly wasn’t a photographer in the same sense that Weegee and Arbus were, but more in the category confirmed by Cindy Sherman’s identity photography. I say “confirmed” because even Sherman has predecessors — none, however, quite as dedicated to the fictionalization and, has been claimed, the demolition or decentering of self that is Sherman’s m.o. (modus operandi). I like Larry Clark’s Tulsa photos, Nan Goldin’s project and a few other photos here and there. I am interested in subjects. I am not entranced by consensus reality, which, since the invention of photography, is photo-reality. I am interested in realities that are not strictly visual. How something is seen is more important to me than how something looks. For how something looks, you can’t beat Vermeer. The details change, but the look stays the same. A silver bowl or a lock of hair in Vermeer and the chrome of an automobile or the teeth of a movie star all look the same to me. That Vermeer probably used a camera of sorts does not explain his hyperreality; it is instead the steadiness of his line, his colors, his hand and the icy way he treats space. Photography treats space like just another shape. Early in the 20th century, after supposedly destroying realistic, representational painting, photography paradoxically struggled to escape frompainting. Yet, I firmly believe: worse than the photography that tries to be painting is most of the photography that tries to be smart. At least the former has a kind of absurd madness to it, albeit totally bourgeois. There are, however, kinds of nonart photographs that I do like: snapshots (but only when they have been discarded, have writing on them and/or are within lovingly pasted but abandoned photo albums); real-photo postcards, and what I call Zen photography. Snapshots are best when they have been discarded as not emotionally accurate enough (i.e., sentimental enough); when the focus or composition is not like all other snapshots (i.e., “reality”); the likeness does not correspond to what either the photographer or the subject expects to see (i.e., “truth”). Or have these images been discarded because the love involved in their taking has flown? In this regard, willfully damaged photographs are the best. What has happened to all those images of brides (or grooms, I suppose) scissored out or merely ripped apart from their mates? What does it say about the mother who, when her daughter gets divorced, goes through all her photographs of the once-happy couple and destroys the offending male? Using an Exacto knife? Photo albums also have their charms. I once found an intact album at a charity sale on Staten Island, put together by a member of a family once housed in a supervisor’s cottages at what was then Sailors’ Snug Harbor. Snug Harbor, now a cultural center, was once (according to a stained glass window in the 1831 Main Hall) a “home for aged and decrepit sailors.” It was founded much before Social Security and Medicare/Medicaid. The Supervisor (he was the chief chef) and his family, as evidenced by the 1920-39 photo album, often visited relatives in Asheville, North Carolina, another one of my favorite places. The son and daughter mature, almost page by page. There are motor-tours; there’s larking. Group photos of the kitchen staff. And then it all stops. Ten black pages. Did Father loose his job? Wander off with the woman of pleasure from the nearby saloon on Richmond Terrace? Or did they all simply move to Asheville, where their relatives were, inexplicably leaving their album behind? Abandoned photo albums are even sadder than snapshots thrown away. Whole lives (systems of illusion, in any case) have been cast into the dust-bin of history. Real-photo postcards are perhaps easier to explain. There was a brief fad for black-and-white photo postcards, disasters like the great San Francisco earthquake or lesser catastrophes being the preferred subjects. Unlike the color postcards, often printed on “linen,” there is no apparent alteration of the photo image. Most interesting are the local and personal real-photo cards. When you go to a postcard bourse and seek out real-photo cards, sometimes labeled as “Actual Photographs,” you will find that they are arranged in categories. You will often be asked by helpful dealers anxious for sales what your category is. Would you believe, dead dogs in the road, Indianapolis, torture scenes, midget weddings, head-on collisions? And then I like what I call Zen photography. Over the course of many predigital years I have taken hundreds, maybe thousands, of 35 mm slides, usually of outdoor sculpture or outsider yard art (on the theory they will always be useful for slide lectures). And then there are all those images of trips to Japan, Brazil, Iceland, or wherever. In filing them away — not a task I looked forward to — I kept a special little place at the end of the alphabet for end-of-the-roll accidents and other mistakes, more often than not abstract, some of them looking more beautiful than Color Field paintings. My finger on the shutter-button took the picture. I have tried shooting at random without looking through the lens or shooting using some prearranged pattern, and nothing gets as good results as a real photo accident. This January, while photographing some industrial ruins in North Philadelphia I slipped, digital camera in hand, on some ice concealed by a layer of garbage. But lo and behold, my camera caught a blurred metal structure as I fell, and then a mysterious, brick-red monochrome. That’s what I mean by Zen photography. Just as, in Zen archery, the arrow is supposed to shoot itself, in Zen photography the photo takes its own picture. And then there is the whole category of surrealist photography, which leads us to the Dora Maar Problem. The Dorsky Gallery (11-03 45th Ave., Long Island City; #7, Courthouse Square stop) is a beautifully appointed nonprofit art space that focuses on affording curatorial opportunities. There are always guest curators. My advice is that anytime you are visiting P.S.1, you should walk a few blocks over to the Dorsky. Curators need to be encouraged too. …introduced them at the press conference of the Jean Renoir film Le crime de Monsieur Lange, for which Maar was a photographer. This meeting took place before the famous episode at the Parisian café Les Deux Magots in which Maar supposedly seduced Picasso by playing a knife game that caused her fingers to bleed. Previous lovers had been, yes, Eluard and then Georges Bataille, which might have been enough. But Picasso opened the doors of posterity. What at first might seem a blessing turned out to be a curse. Those lovely, blood-stained fingers are on every print — pre-Picasso, Picasso period, and post-Picasso. If you Image-Google Maar, you will see endless Picasso “portraits” of her, a few homage-to-Maar lamps by ceramist Jonathan Adler, and perhaps four photographs of her own, over the course of 12 Image-Google pages! By the Google standard, she was a failed photographer. But a successful artist model and muse. How do we judge her photographs, now that we care very little about her relationship to Picasso? We judge them like any other art. If the Dorsky Gallery exhibition is a fair sampling, the work, alas, is not all that consistent. Compared to Lee Miller (1907-77), Maar never developed a strong personal vision. For Miller — a great beauty herself and not unconnected to the Parisian art world — it was her war photography that finally freed her from the aura of her liaison with Man Ray. She gained fame from her photographs of the London blitz and of the battlefront. Her famous photograph of a dead German soldier is too gruesome to grace this screen, although I suppose one could argue that it tells you what war is really about. Then too I have direct evidence about how willful Miller was. As commissioners of the first (and I think last) Tokyo Biennial of Figurative Art, we men were celebrating the completion of the jurying process in a former 19th century palace with a view of Mt. Fuji. It was now a geisha house of high repute. Miller insisted that she accompany her husband, Sir Roland Penrose. This was unheard of, but she persisted. And the Japanese solution was that all the wives of the Japanese commissioners were asked to attend the dinner party also, much to the amusement and slight confusion of the geishas. Each wife was assigned a geisha, just like the men. 1. 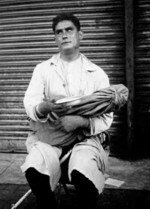 Blind Beggar, 1934, is of a seated man holding a peculiar package as if it is the infant Jesus, either still-born or a victim of crib death. The expression on his face, as with tilted head he appears to look off to his right, is one of the great face-pulls in art. Leaving aside the ethics of photographing a blind beggar (or my using of the image above), it can be described only as an inadvertently beatific, what-am-I-doing-here look. 2. Man Looking Inside a Sidewalk Inspection Door, c. 1935, with no face visible, shows curiosity with the body alone. It could also be called Ostrich. Or The Art Critic. Here too, the accidental looks meaningful: the trap-door key to the inspector’s right on the pavement; his left hand flat on the ground, elbow straight up; the lift of the left toe of the approaching pedestrian, who is also headless but because of the photo rectangle. 3. Portrait d’Ubu, 1936, is the most marvelous Maar. As someone who — strangely enough — has as an artist been compared to Alfred Jarry, how cannot I but love this homage to his proto-Dada stage monster of all time? Does it really depict “the fetus of an armadillo” or is it something worse? 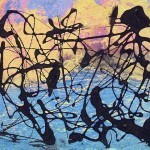 Unfortunately, it is not in the Dorsky exhibit, but you can see it by clicking here.